Investigator is a user-friendly online platform that allows life science companies and suppliers to the NHS to quickly build a picture of their healthcare customers. 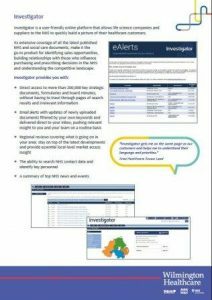 Its extensive coverage of all the latest published NHS and social care documents, make it the go-to product for identifying sales opportunities, building relationships with those who influence purchasing and prescribing decisions in the NHS and understanding the competitive landscape. 01268 495600, email info@wilmingtonhealthcare.com or complete the enquiry form below. Our NHS Guide is out of stock. Please visit our Knowledge Hub for NHS news and content. The NHS Guide provides a comprehensive overview of the NHS, enabling you to fully understand its structure, strategy, policy and plans.